On Thursday, October 19th at 6:00 pm the Community and Economic Development Department will be hosting their Annual CDBG (Community Development Block Grant) Action Plan Community meeting at La Sierra Senior Center (5215 La Sierra Avenue). 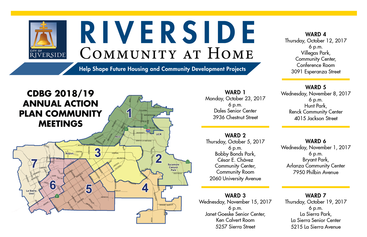 The purpose of the meeting is to receive information and provide input on future housing and community development needs. 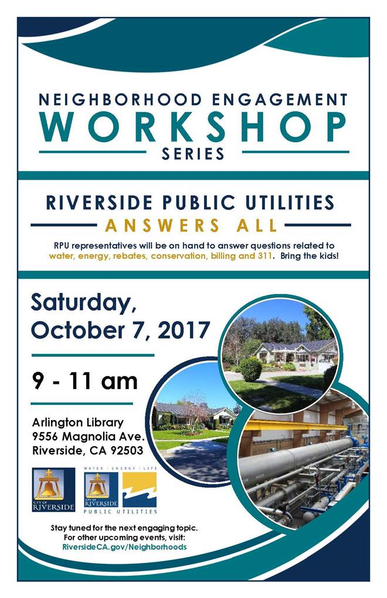 Your participation is very important, residents are encouraged to attend, voice their opinion and help develop the 2018-2019 action plan. 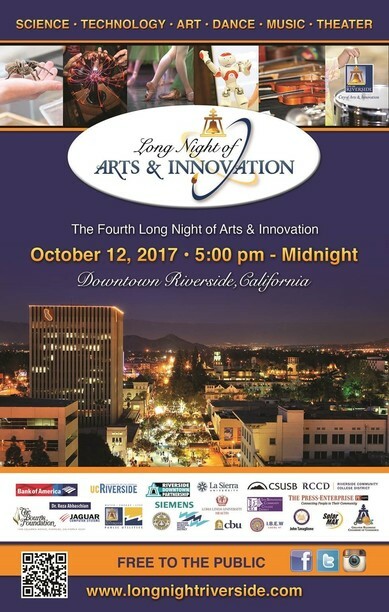 Please see flyer below for additional details. It’s that time of year again! The Ward 7 City Council Office has once again partnered with Love Riverside and Meridian Gardens of Riverside for their annual LOVE RIVERSIDE Serve Day. On Saturday, October 21st, volunteers will gather at Sherman Indian School at 8:00 am for the Kick-Off Rally and will make their way to their designated project site from there. This year our Making Memories project with Meridian Gardens of Riverside is at its capacity. A huge THANK YOU to all of the volunteers who registered for the project! 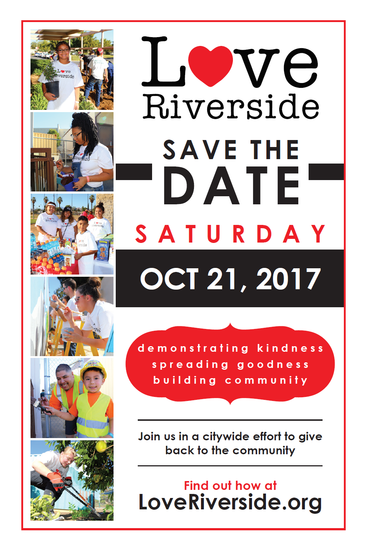 However, please do not be discouraged, there are still plenty of opportunities to participate in the LOVE RIVERSIDE Serve Day. To see a list of available projects, please visit loveriverside.org and join us in demonstrating kindness, spreading goodness & building community! 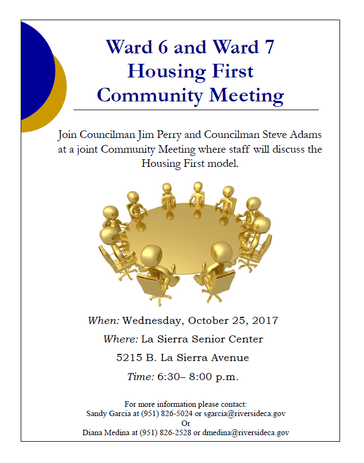 On Wednesday, October 25th Councilman Jim Perry and I will be hosting a joint Ward 6 and Ward 7 Community Meeting to hear a presentation from staff regarding the Housing First model. The meeting will be held at La Sierra Senior Center from 6:30 – 8:00 pm, please see flyer below for additional details. 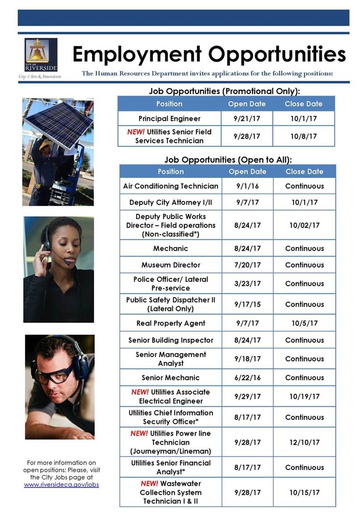 Please see flyer below for employment opportunities with the City of Riverside.